Forced Entertainment is a Sheffield-based theatre company founded in 1984. Touring and presenting their ground-breaking provocative performances across the UK, mainland Europe, North America, Japan, Australia and further afield, the group has sustained a unique collaborative practise for more than thirty years. 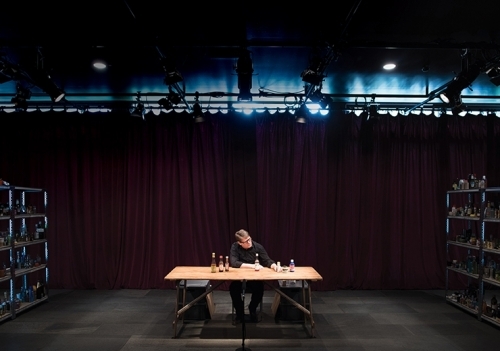 Led by the artist and writer Tim Etchells, the Forced Entertainment company includes designer and performer Richard Lowdon alongside performers Robin Arthur, Claire Marshall, Cathy Naden and Terry O’Connor. Over the years this core ensemble has been augmented by contributions from many guest artists and performers. In March 2016 Forced Entertainment became the first ever UK based recipients of one of theatre’s most prestigious awards, The International Ibsen Award. Honouring extraordinary contribution to art and culture, it is awarded every two years by the Norwegian government. The first ever group to win the prize, Forced Entertainment will receive the Award during the International Ibsen Festival at the National Theatre in Oslo in September. One by one, over 6 days, Forced Entertainment performers condense 36 Shakespeare plays into a series of works of less than an hour each played out on a one meter tabletop – each play comically and intimately retold via a series of lovingly made miniatures and a collection of everyday unextraordinary objects. Forced Entertainment have long had an obsession conjuring extraordinary scenes, images and narratives using condensed language with precise implications. In this remarkable departure for the company, Complete Works explores the dynamic force of narrative in a simple and idiosyncratic summary of Shakespeare’s comedies, tragedies, histories and late plays, creating worlds as vivid as they are strange.